West Indies 136 -1 (Dwayne Smith 65, Chris Gayle 63, Kyle Mills 1-7) beat New Zealand 190 – 9 (BJ Watling 60, Jacob Oram 32, Adndre Russell 4-45) by 9 wickets (Duckworth – Lewis method). Andre Russell ripped through the top order batting of New Zealand as Chris Gayle and Dwayne Smith punished their bowlers enabling West Indies to an easy victory. New Zealand scored 190 runs with one wicket in hand at the end of the measured 50 overs. The target was revised to 136 in 33 overs as per Duckworth Lewis Method due to rain interruption and West Indies attained the required runs with 8.4 overs to spare. Andre Russell (West Indies) was declared ‘Player of the match’ after he clinched 4-45 runs. The first One Day International of the five match series was held at Sabina Park, Kingston, Jamaica, on Thursday, July 5, 2012. Earlier, the captain of West Indies Darren Sammy, won the toss and elected to field first keeping in view his bowling strength. The decision paid off as the Black Caps lost their first wicket for just three runs in 1.1 overs when Daniel Flynn joined in with Rob Nicol. They tried to stabilise the innings, posted few boundaries and took the score to 30 as Flynn was clean bowled by Andre Russell for 12 runs. Nicol followed him three runs later after scoring 14 runs and became the third victim of unplayable Russell. The fourth wicket fell at 48 in 14.4 overs as the skipper Kane Williamson and the youngster BJ Watling got together in the centre and stopped the invasion of the bowlers for a while. Watling was the most aggressive of the two, scored few boundaries and the score was enhanced to 71 in 23.4 overs. Williamson was caught behind by the wicketkeeper Denesh Ramdin off Sammy for 24 as the all-rounder Jacob Oram came to the crease. The run rate was pushed up by the two batsmen as Oram hit a couple of sixes and the first hundred of the innings was scored in the 34th over. The fifth wicket partnership produced 46 runs when Oram was bowled by Ravi Rampaul for 32 off 39 balls with two sixes and even fours. Watling took over from thereon, attained his fifty in the 44th over as the wickets kept on sliding from the other end. He was the ninth batsman who went back to the pavilion for 60 from 98 balls with the assistance of 5 fours. New Zealand managed 190 runs for the loss of nine wickets at the end of the 50th over. Andre Russell broke the back of the Kiwi’s batting by grabbing four wickets, Ravi Rampaul and Sunil Narine shared two wickets each whereas Darren Sammy claimed one wicket. West Indies lost their first wicket for six runs when Lendl Simmons was caught behind by Watling off Kyle Mills without opening his account. 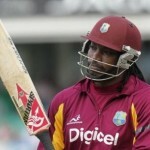 Dwayne Smith joined in with the master blaster Chris Gayle and the complexion of the game was changed instantly. They gathered 11 runs in the sixth over with a six from Gayle and a four from Smith and the first added 10 runs in the 8th over with one six and even four. The first fifty of the innings was posted on board in the 12th over with two sixes and the boundaries were flowing from the willows of the two batsmen. Gayle was the most furious of the two and rushed to 49 off 42 balls when the play was stopped because of rain as the Caribbeans reached at 93-1 after 18 overs and Smith was unbeaten for 38. The play resumed nearly after a couple of hours and the home team required just 43 runs in another 15 overs as per Duckworth – Lewis method. Chris Gayle achieved his fifty in the 19th over and Dwayne Smith joined him in the following over with one six and one four. The latter was dropped on 53 on the first ball of the 23rd over by Rob Nicol off Tim Southee and he never looked back from there. The target was achieved on the second ball of the 25th over when Smith collected two runs. West Indies thrashed the required 136 runs in 24.2 overs with nine wickets in hand. Chris Gayle was unbeaten for 63 off 57 balls with 5 huge sixes and 4 fours as Dwayne Smith held his end with 65 from 77 deliveries with the assistance of 3 lofty sixes and 6 fours. West Indies won the first ODI with a big margin of nine wickets and are leading the series 1-0, the second match will be played at the same venue on July 7, 2012.